Bookended by a funeral and a wedding, Bridget Jones’s Baby feels like the direct sequel to Bridget Jones’s Diary that The Edge of Reason impersonated. Indeed, a late-film flashback chronicling the arc of Bridget (Renée Zellweger) and stodgy “Mawk Dawcy” (Colin Firth) contains no clips from the series’ second film. Clocking in at just over two hours, Bridget Jones’s Baby doesn’t adopt the sharp efficiency of Diary. Fortunately, with the return of Diary director Sharon Maguire and an dedicated cast, Baby does replicate the original’s ribald charm and chemistry. Released 15 years after Diary, Baby retunes its protagonists from 20-something Gen Xers looking for romance to 40-somethings in search of parenthood. Bridget and Mark open the film at the funeral of scalawag Daniel Cleaver (Hugh Grant, who appears via photo only), the casualty of a mysterious plane crash. Mark is accompanied by Camilla, while Bridget is married only to the wine she imbibes alone that evening for her 43rd birthday. Bridget and TV anchor gal pal Miranda (Sarah Solemani) go on a weekend of drunken glamping, where Bridget climbs into the yurt of Jack Qwant (Jack Dempsey), a hunky American mogul who has patented an online matchmaking algorithm, a needless plot appendage. Several days after Bridget and Jack shag, Bridget and Mark cross paths again at a christening, where Mark reveals that he’s separated from Camilla. Of course they also end up between the sheets, and a few weeks later Bridget discovers she’s pregnant with uncertain paternity. Surprisingly, and most welcome, is the fact that both Darcy and McDreamy want to be father and neither are perturbed at Bridget about the predicament. 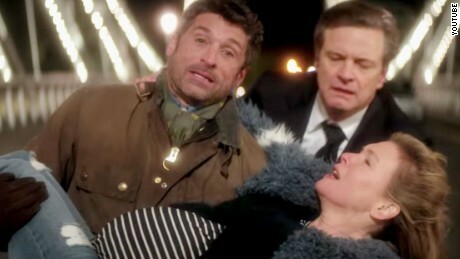 Still, the rest of Bridget Jones’s Baby is the rather predictable course of miscommunications, male posturing and mishaps, culminating with the requisite race to the hospital. There’s about 20 minutes of padding, enlivened mainly by the rapier Brit wit of Emma Thompson, who’s not given nearly enough screen time as Bridget’s droll obstetrician. The script’s jokes span the spectrum form timely to dated. Bridget’s newsroom is co-opted by new hipster owners sporting beards and man-buns, whose desire to outsource newsgathering to citizens and their camera phones meets with risqué results. On the other hand, the only thing Mark knows about “Gangnam Style” is that it’s a suburb of Seoul, an admittedly amusing payoff to a musty setup. Otherwise, Bridget Jones’s Baby is a cozy reprise with enough callbacks for fans of the original: Shirley Henderson, Sally Phillips, and James Callis return as Bridget’s buddies; Bridget's daft parents (Gemma Jones and Jim Broadbent); even the layout of Bridget’s flat. But it’s the somehow-it-works rapport between Zellweger and Firth that forms the film’s heart and sates the audience’s sense of nostalgia.